This beautiful 14k white gold diamond halo pendant has .40cttw of diamonds set in a "Miracle Mark" setting giving it the Look of .75cttw. 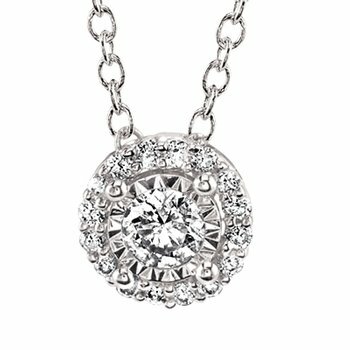 The pendant has (1) .28ct round center diamond and (14) .011ct round diamonds on the halo. An 18" white gold chain is included.